I had been looking on eBay and the internet for these parts for some time, but was not prepared to pay the excessive prices people are asking for them as used parts. So when I saw these new products on the Famous Four web site, I pressed the button and purchased them, for what I thought was a reasonable price. They were packed very well and arrived in good time. The binnacle front was a perfect fit, and looks great. 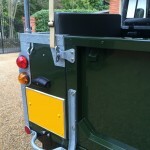 The front closing panel also fitted brilliantly. I had to drill two small holes, one at each corner, and all other holes lined up perfectly. It seems to be made out of slightly thicker material than the original, which can only be good and should last longer than the original. If this is the standard of all Famous Four’s re-manufactured parts, I won’t hesitate to purchase from them again. 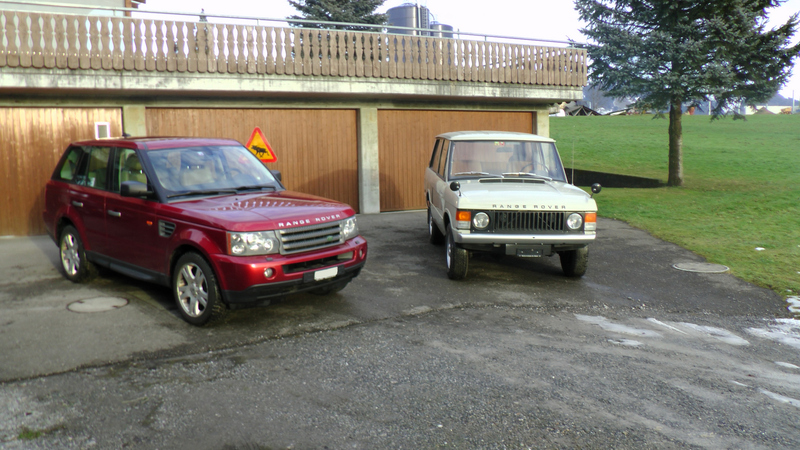 My old lady arrived in Austria in October 2016. 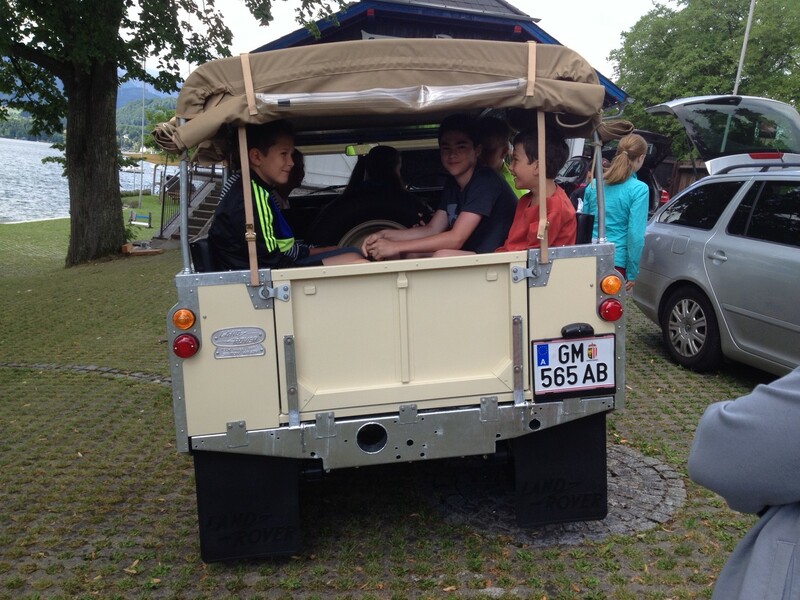 She was transported on a trailer from Yorkshire close to my home in Gmunden / Austria. I just had to drive her to my house. 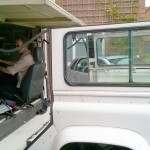 Somebody had connected the distributor leads the wrong way round, which created some misfire, but I made it home. I bought her via the Internet; she was supposed to be in good shape. 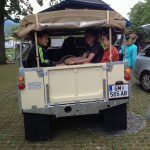 However I realised that there was no way for her to pass the Austrian MOT. 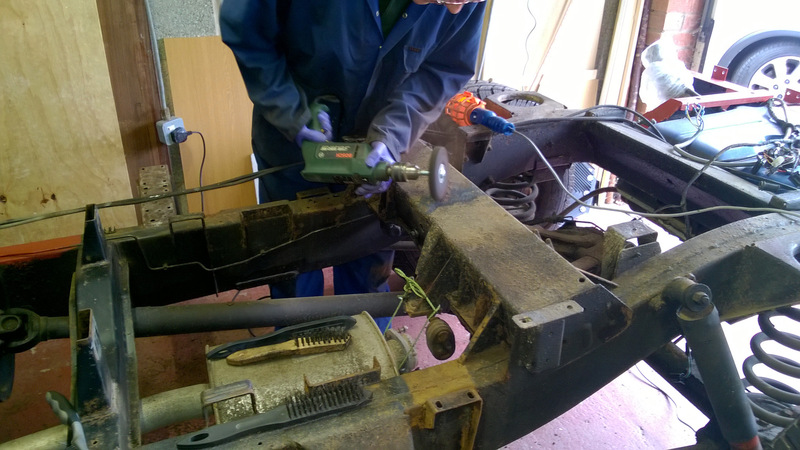 The rear end of the chassis was totally rusted, the bulkhead consisted mainly of body filler…. 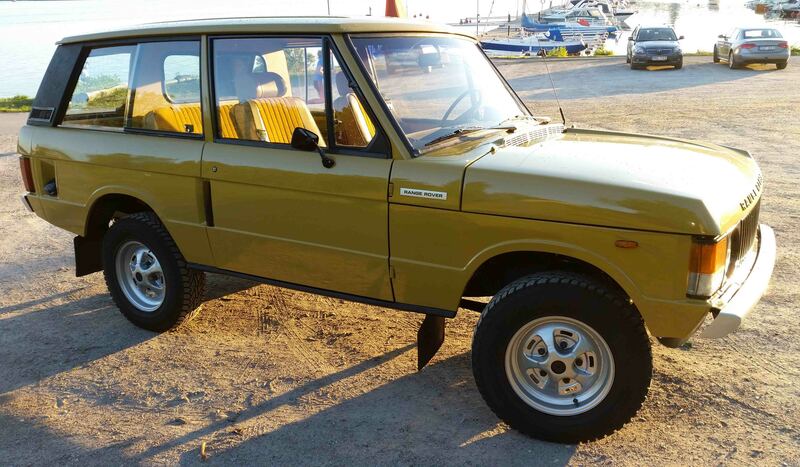 But she was freshly painted in limestone! 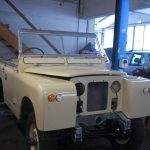 It turned out that the engine, exhaust, gearbox, axle and brakes were in good condition, but the bodywork and the steering needed extensive attention. 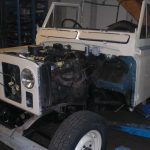 I decided to perform a frame off restoration, so I bought a new galvanized chassis from Richard’s, found a restorable bulkhead from a Land Rover dealer over here and contacted Famous Four for the supply of the spare parts needed. 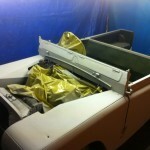 After disassembling the whole vehicle I had all body parts stripped of paint. 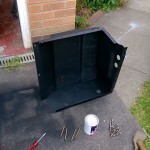 The cappings, window frames etc have been painted in silver; I had them zinc plated. 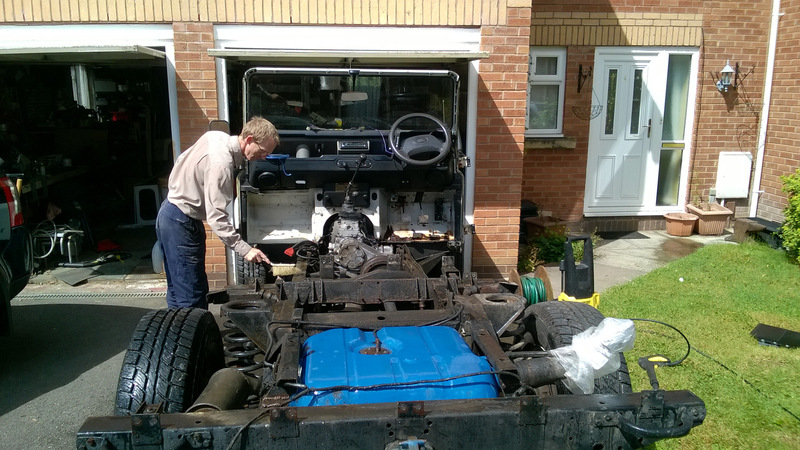 When reassembling the Landy I changed every bolt and nut, all the seals, all joints, the complete wiring harness. 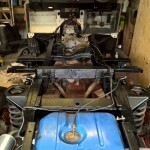 I had to rebuild the seat box, change all the oil rings and seals on the engine and gearboxes. 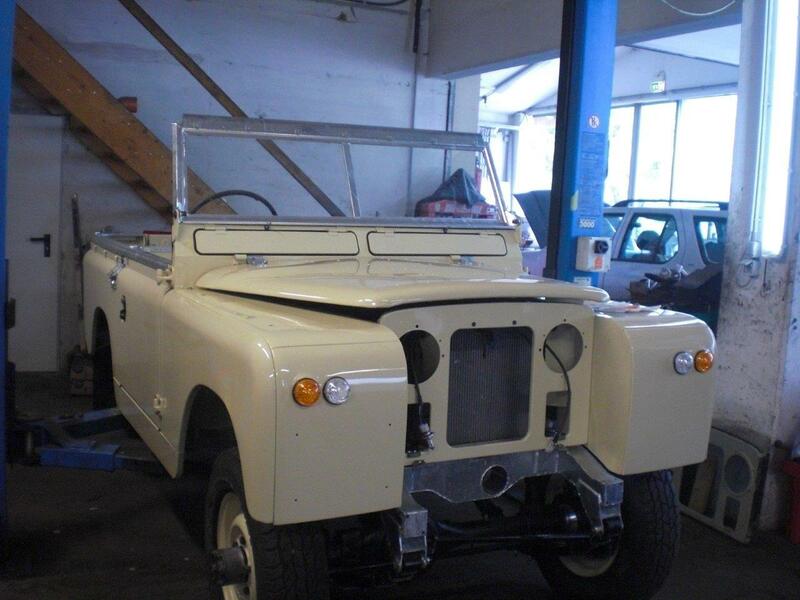 Special attention had to be given to the steering system, all joints and worn parts have been changed. 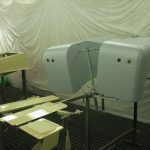 Once back from the paint removing shop I discovered quite a number of body parts were badly corroded, such as floor panels, inner wing panels, front grill panel, doors, rear end panels etc. I replaced them all with the help of Famous Four. 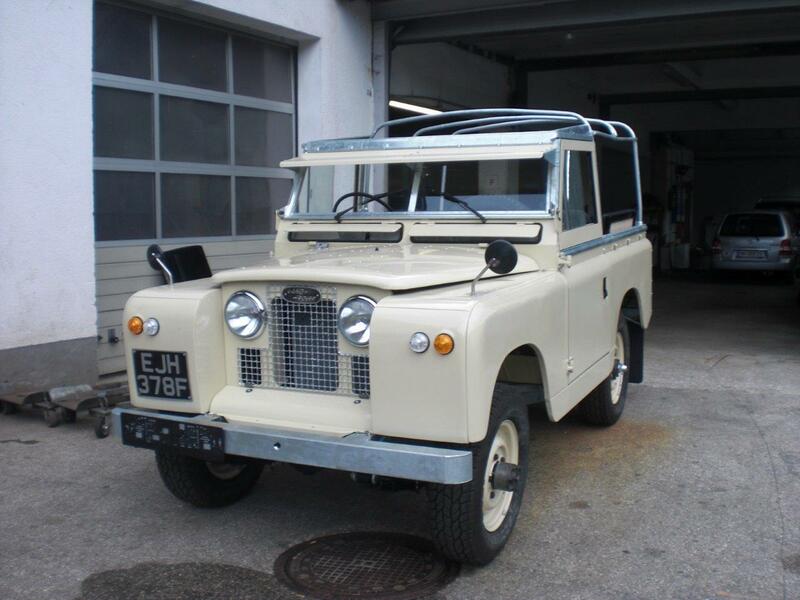 I decided to paint the Landy once again in limestone as this is a color which is not very often seen here in Austria, and attracts her. I paid special attention to use the right types and sizes of the rivets and tried to make the vehicle as close to the original as possible. 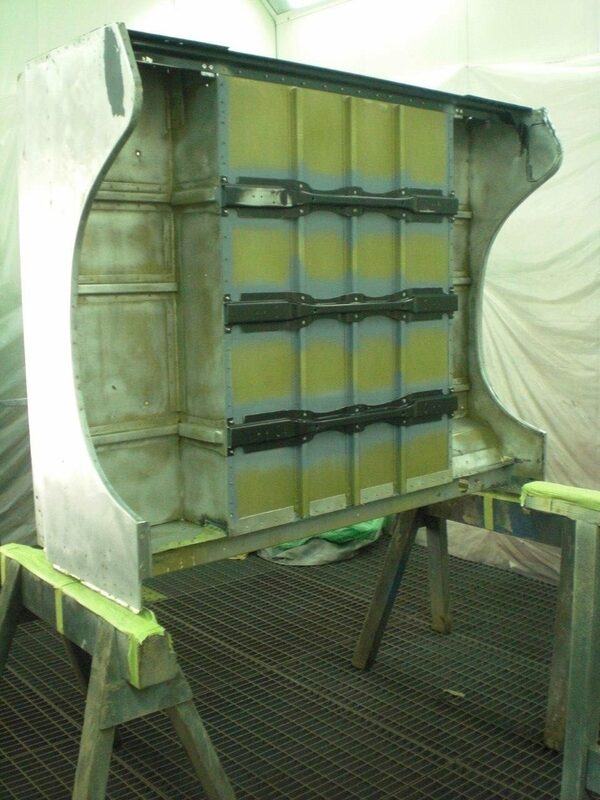 I did not use any filler on the body parts, so one can see the spots on the panels caused from the spot welding. 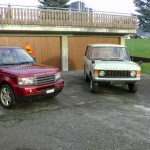 After 6 months of work my old Lady was back to the road, and successfully passed the Austrian MOT. 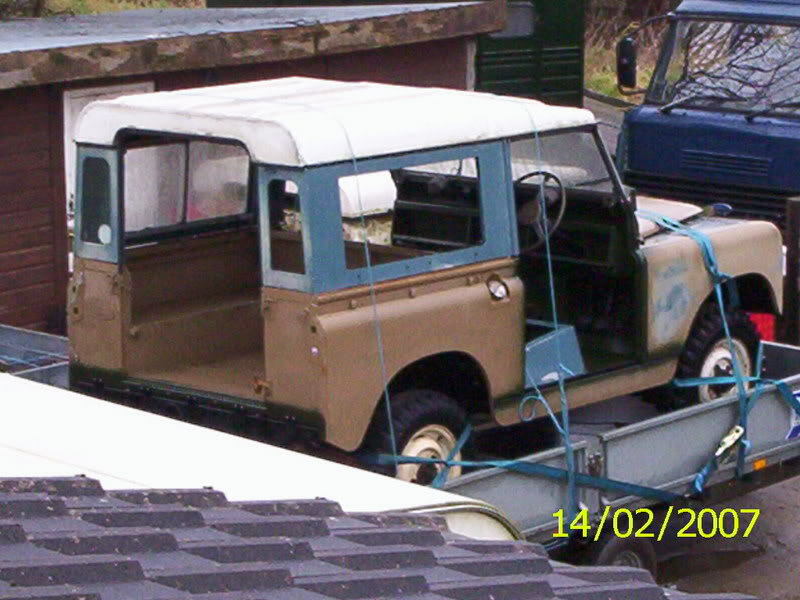 She is good now for another 50 years of service and is behaving as a real Land Rover Series 2A should. The first job she has done in her new life was to transport 7 children from the local rowing club to attend a rowing race. 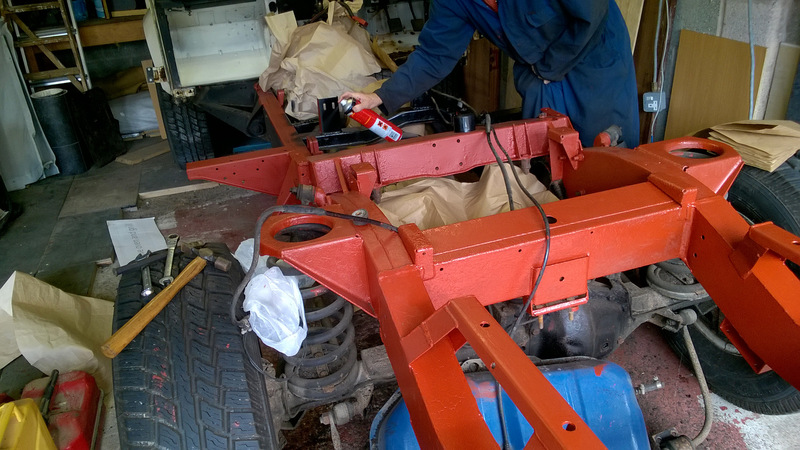 I have to thank Famous Four (especially Dave Funnell) for their great support and patience, my local workshop “Auto Thalhammer” who performed all the mechanical work including painting, and Richard’s Chassis. 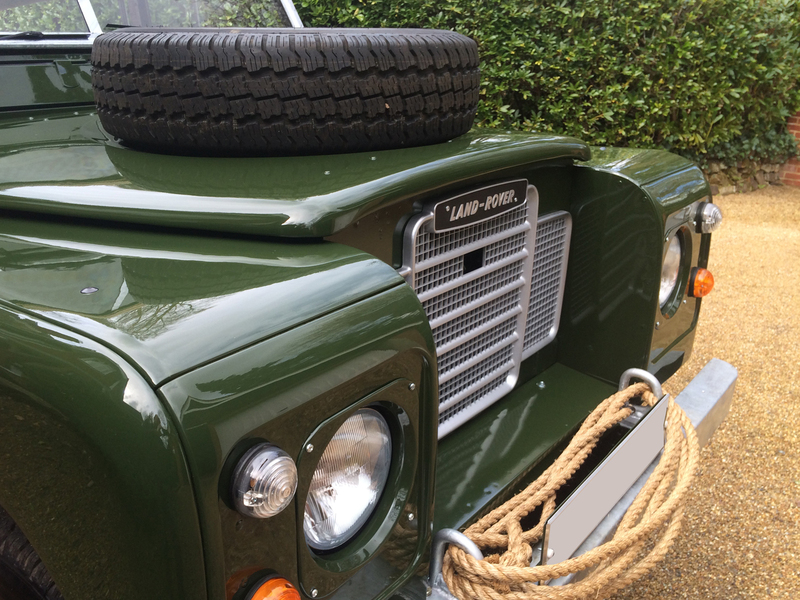 We were most pleased to hear from one of our many valued UK mail order customers via email recently , with some photographs of his rather beautiful Series III Land Rover. 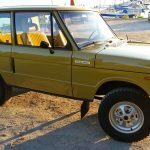 He has been buying parts from us during the past two years, with personal help from one of our experienced sales guys, Andy Baxter. 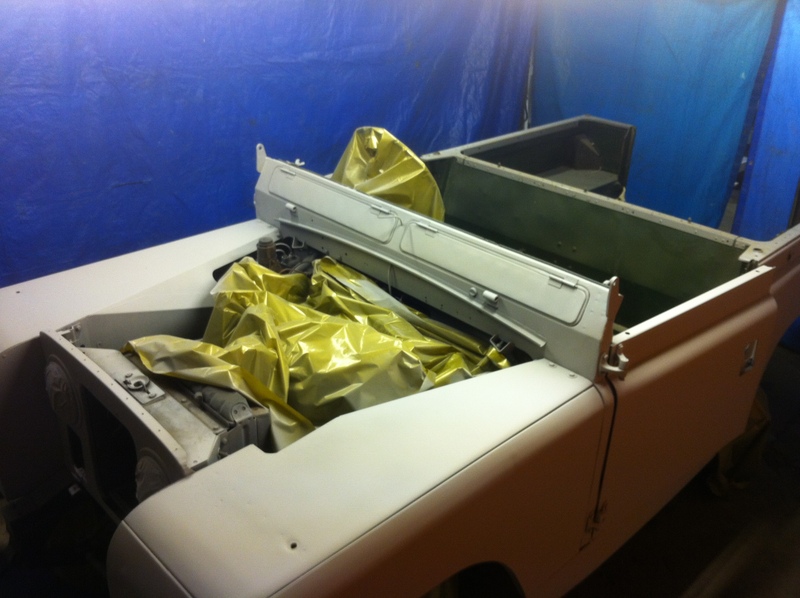 The resulting restoration is to a very high standard, we are sure you will agree. 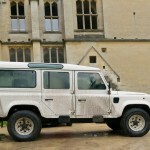 Vehicle: White Defender 110 300Tdi County Station Wagon, 1994. 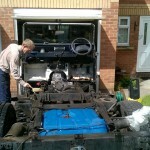 Now the chassis was sorted we could turn our attention to the rest of the vehicle. 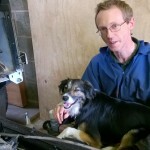 The drivers foot well was cleaned up and inspected by everyone, including our dog. 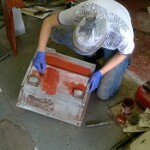 The rusted section was cut away to allow a repair plate to be welded in after the base had been treated with a zinc spray. The small holes to the outside were covered from underneath after the welding and undersealed to prevent water getting in. 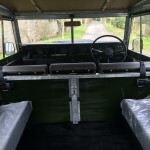 The front seat box had seen better days and so we drilled out all the pop rivets, welded patches where necessary, and cleaned and painted the separate sections before reassembling it. 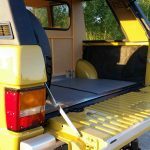 All the seams were sealed to make the tool box water tight, and the battery compartment vents were cleared and cleaned. With the rear tub off, this seemed like a good time to repair the sills and clean and underseal the tub itself. An airline took care of much of the loose dirt (and paint) and what was left was wire brushed. New door hinge bolts were fitted at this point courtesy of a stainless steel door bolt kit. 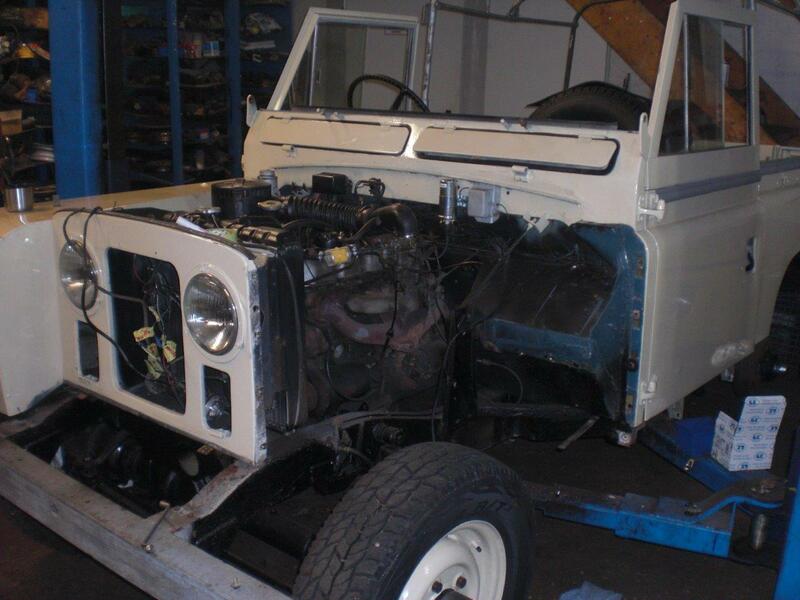 With the underside surfaces taken care of, it was time to start to reassemble the parts into a whole Land Rover again. 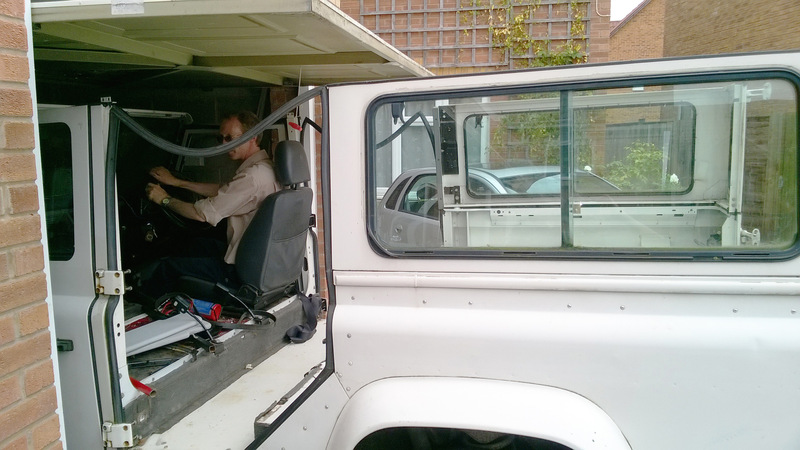 Slowly the vehicle started to come back together, although there were times when we felt that everything we looked at created another two jobs to do! 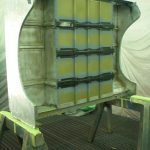 But brackets were removed, cleaned and painted; panels treated for corrosion if evident and painted, and crucial parts replaced as necessary. The old headlining had sagged and I was hoping to repair it (a cunning plan involving a hole cutter and spray adhesive) but sadly this was not to be – the failing material is foam backed and after 21 years the foam has decomposed and is crumbling so the headling falls away from the shaped liner that holds it up. 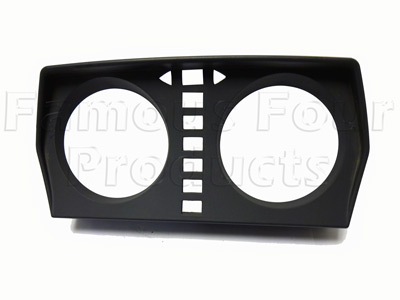 New headlining material was therefore ordered and will be used to replace the old (keeping the same backing pieces). We also ordered a new carpet set from a well known trim company. 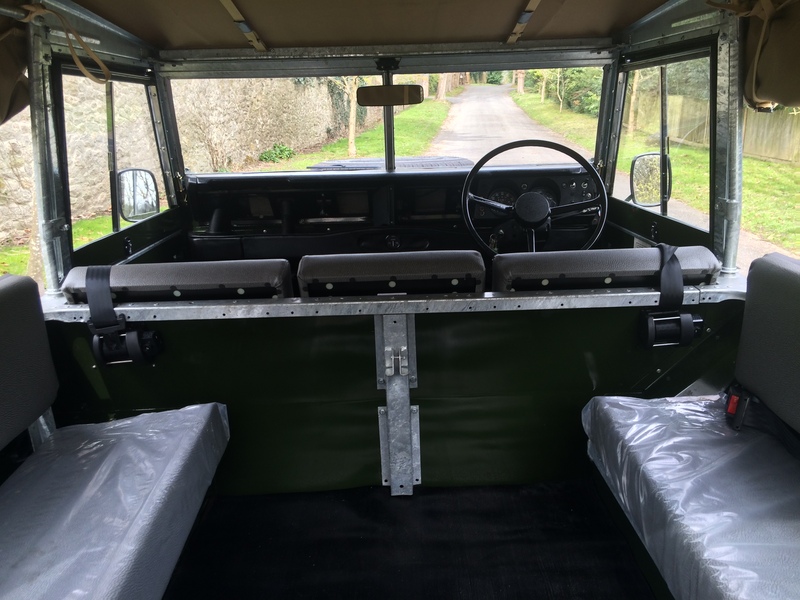 A trial fit showed how good this will look once we finish fitting it, although I was surprised how much adjustment we are having to make – I hadn’t considered a 1994 Defender as an old model but quite a few of the holes are clearly for newer fittings and accessories. 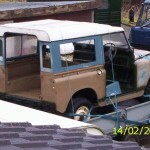 However this is a Land Rover and anything is possible if you persevere. 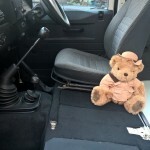 The carpet kit came with a new leatherette gearstick gaiter, however when we tried it in place we both decided to stick with the old rubber Defender one – it just seemed a bit more, well, Land Rover-ish. Fortunately the old rubber gaiter cleaned up really well in a mix of washing machine fluid and washing up liquid (a friend recommended “Put it through the dishwasher, it’ll come up a treat!” but since we haven’t got a dishwasher we had to find an alternative method, or buy the required equipment). 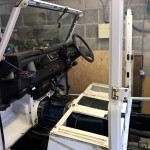 We now have the vehicle back together (doors and roof on) and relatively weather tight, freeing up the garage for working on the headlining. 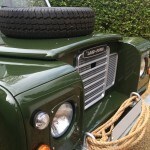 It’s a good sight, and with the front carpets fitted (and other original accessories) the Defender is looking even better than the day we bought it. There are still jobs to do. 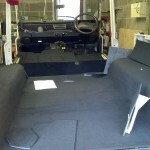 The rear section still needs the carpet fitting. 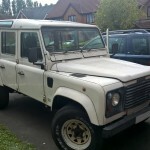 The alpine light rubbers could do with replacing and I’d like to clean up the front grill and headlight surround. 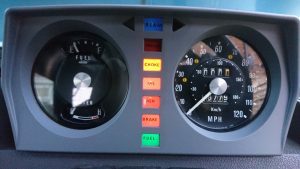 The engine is due for a minor service and I also plan to renew the front brake callipers (rusty but working) and discs (a bit scored) and rear brake callipers (also showing their age) so the brake system is as good as new. The steel wheels could do with a wire brushing and a new coat of paint too. All of this (and a wash, wax and polish…) will take place over the next few weekends as our working holiday comes to an end. 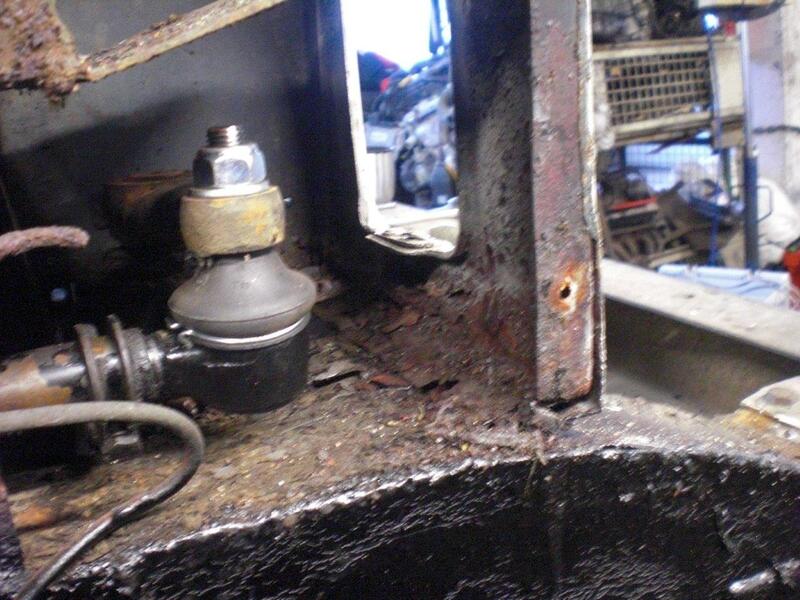 Finally, the front bulkhead will need some work in a couple of years too but that, I think, will be another story. 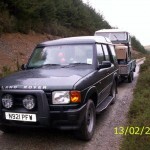 We bought our Defender 110 300Tdi County Station Wagon from Famous Four in Feb 05 to replace a petrol V8 Station Wagon. 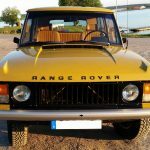 Having discovered Famous Four while we lived in Lincolnshire in 1994, and been impressed with their help and knowledge, I was happy to buy a vehicle from someone I felt I could trust. The price was right and despite having moved to Gloucestershire by this time, we went to view the Tdi. 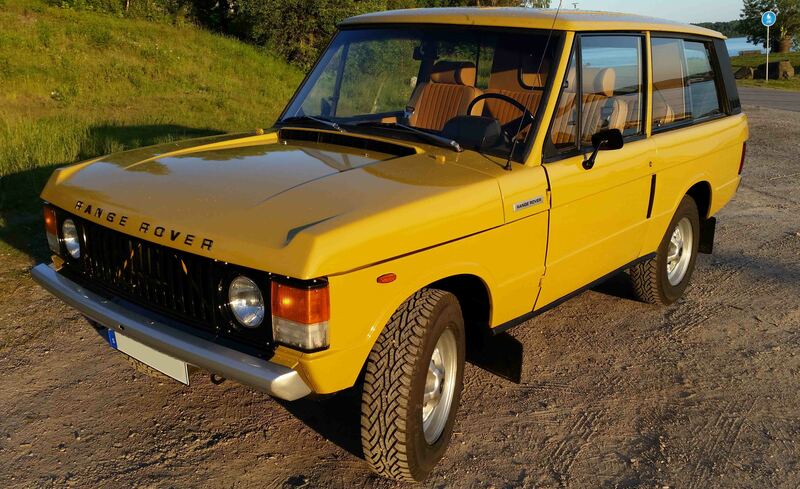 I was initially skeptical about things like wind up windows on one piece doors (very un-series) however after a chat and after my daughter negotiated the inclusion of an official Land Rover teddy bear in the sale, we bought it and the vehicle has served us well ever since. 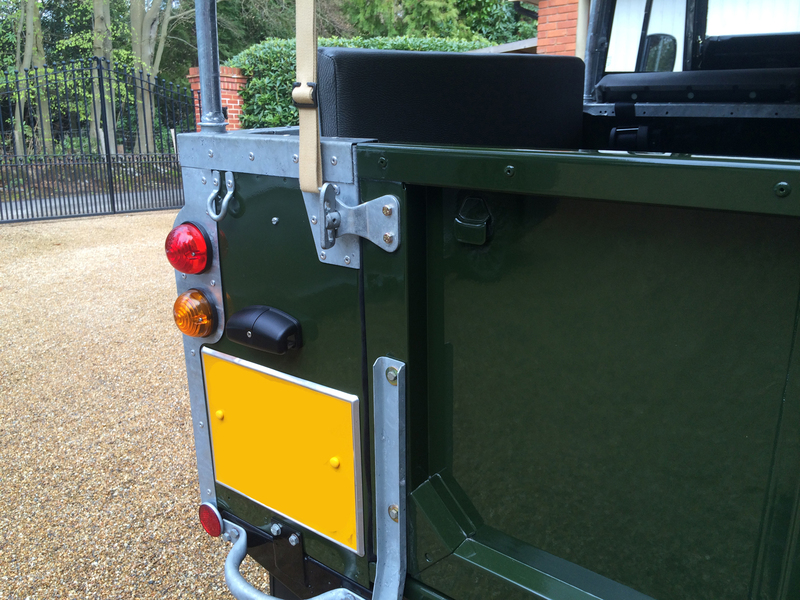 The Defender has to be stripped to fit in a domestic garage, and even then it’s a tight fit! 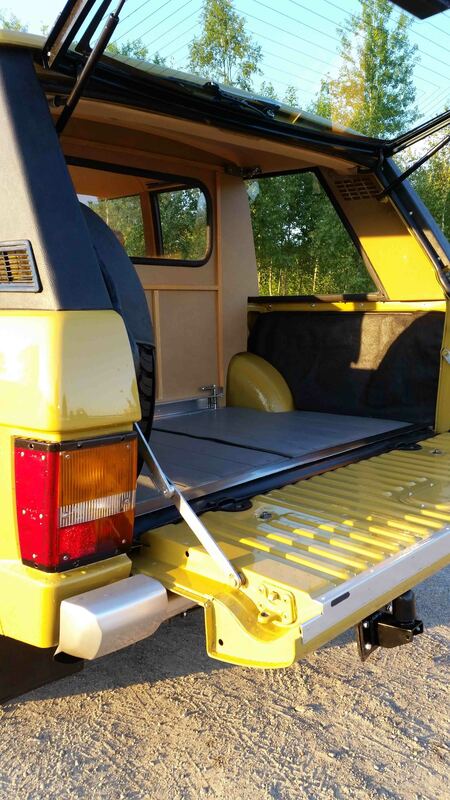 With the doors and roof off the vehicle feels lighter and more airy… almost making me want a soft top version, but then I’d probably change my mind when winter arrives. 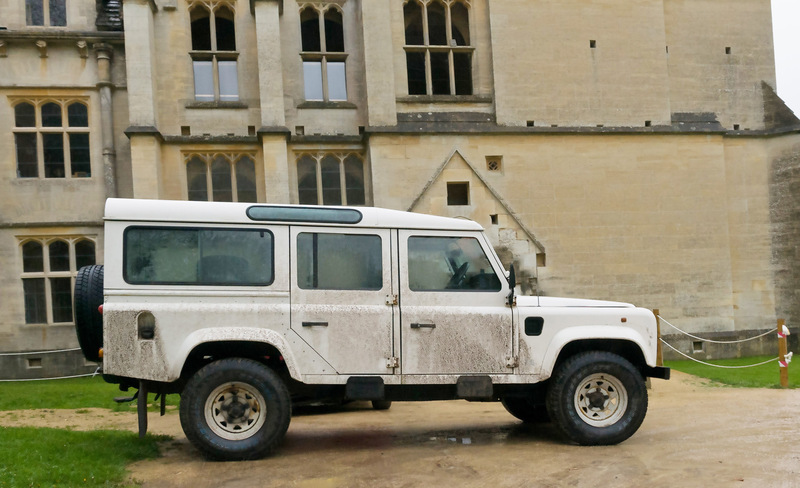 One of the things I really enjoy about the Defender and Series vehicles is the simplicity – the ideal cross between Meccano kit and Tonka toy, it really is unlike any other car I’ve met. 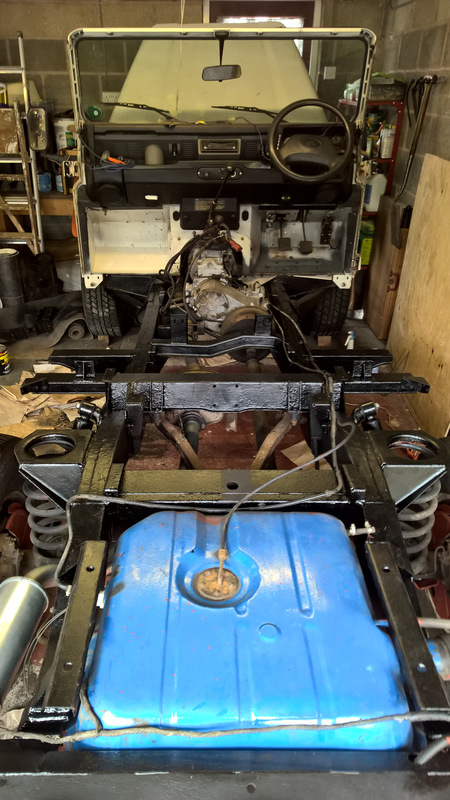 After a brush down and pressure wash (only possible due to manual labour and the defenders handles now the body was off) we could see the overall state of the chassis. 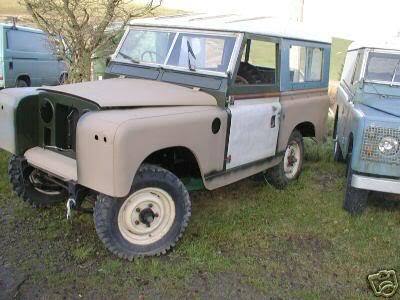 Not as bad as it first looked but still in need of TLC. 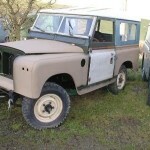 Some surface rust to deal with but fortunately no plating needed. 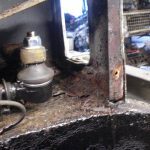 The drivers foot well was a different story and in need of a repair. We decided to change the rear shock absorbers too since the old ones were getting a little tired. 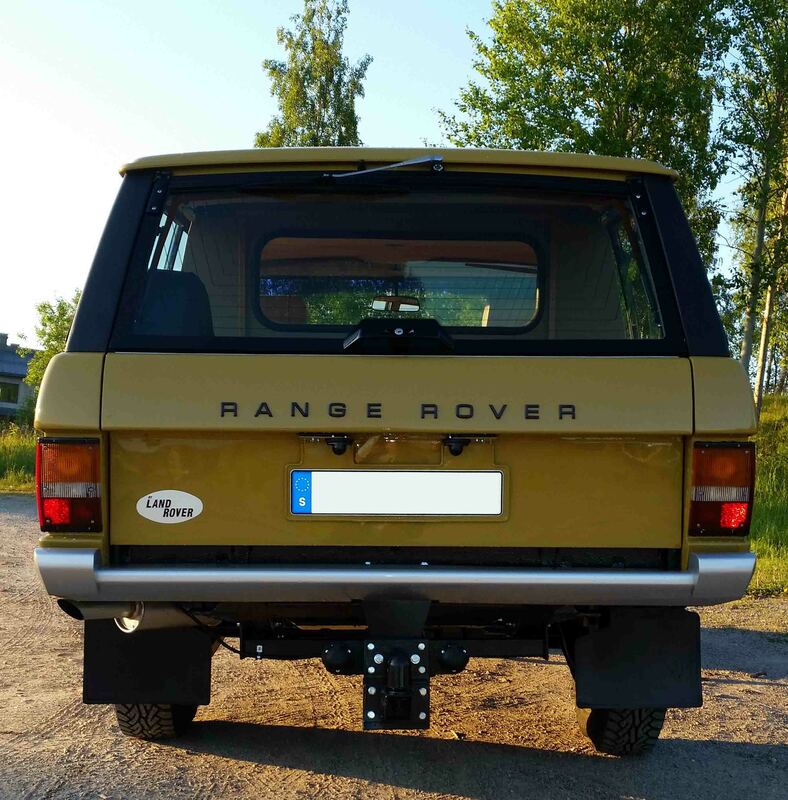 A new rear exhaust section was also needed. 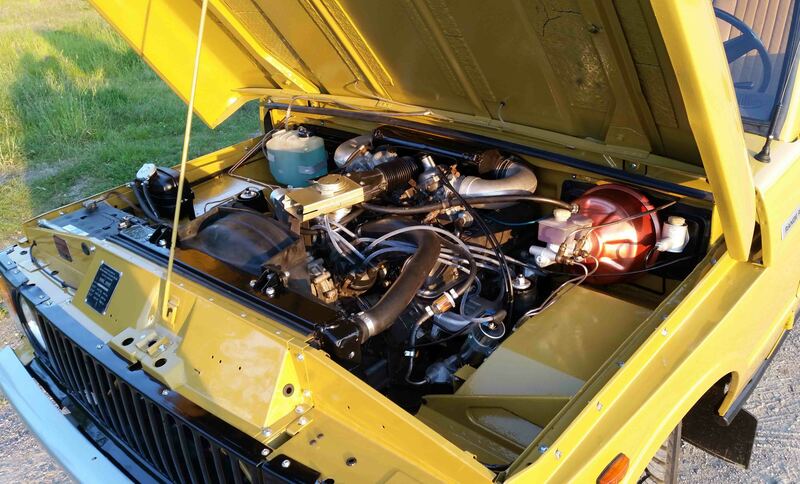 With a long list of parts, some routine, some quite obscure, I called Famous Four to get them ordered – a long job that was made so much easier by the knowledge and help from the Famous Four staff – many thanks guys! Once inspected we could start on the clean up. Old waxoyl and underseal came off relatively easily using stainless steel pan scourers from the local super market. We got through many of these; I even thought about posting an online review but I’m not sure the company would appreciate the endorsement. 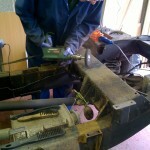 The exposed chassis was then wire brushed and surface rust scraped and chipped off. 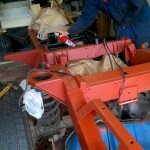 Once cleaned, the chassis was given a coat of Red Oxide primer and then black stonechip paint. A coat of waxoyl/underseal mix went on top of the stonechip for further protection. 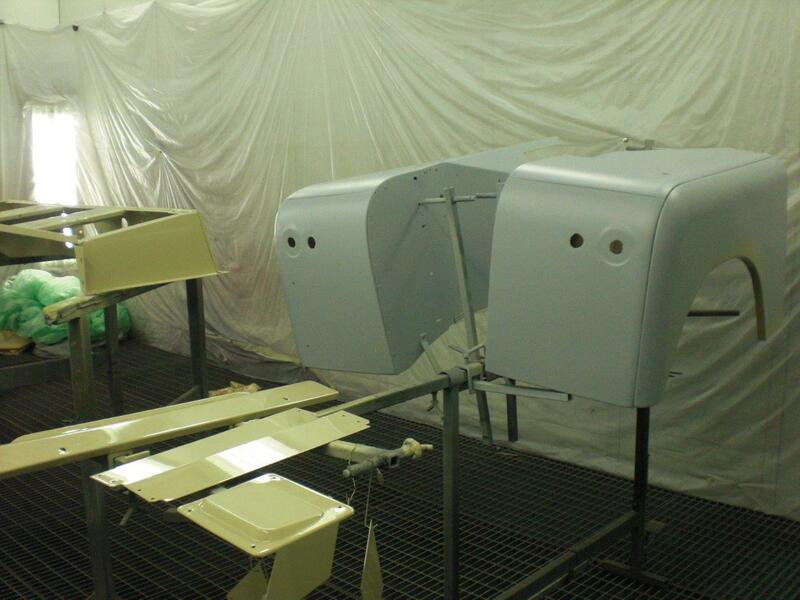 Although this stuff takes ages to touch dry I wanted the flexibility it would provide as the chassis flexes. 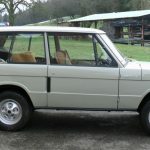 A joke was made a several years ago that I would like an old Land Rover (to join the family tradition – both my Husband and son have Land Rovers) made in 1963, the same year that I was born, to cherish and grow old gracefully together. I came home one evening in February 2007 from work to a shout from my husband to come and look at something on the computer. 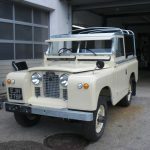 There was my husband and son looking through eBay and they both said “We have found you a Land rover, what do you think?” It was perfect; it was a 1963 Series 2a SWB. 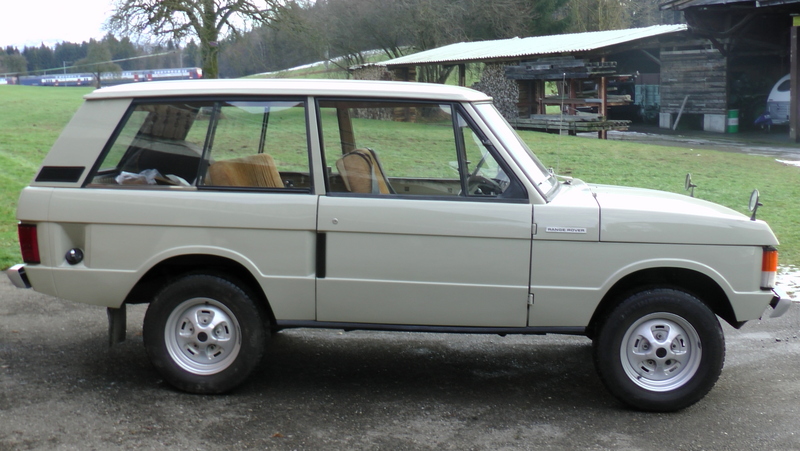 I looked at it and said “Yes I would very much like that or one similar, shame it has ended”. 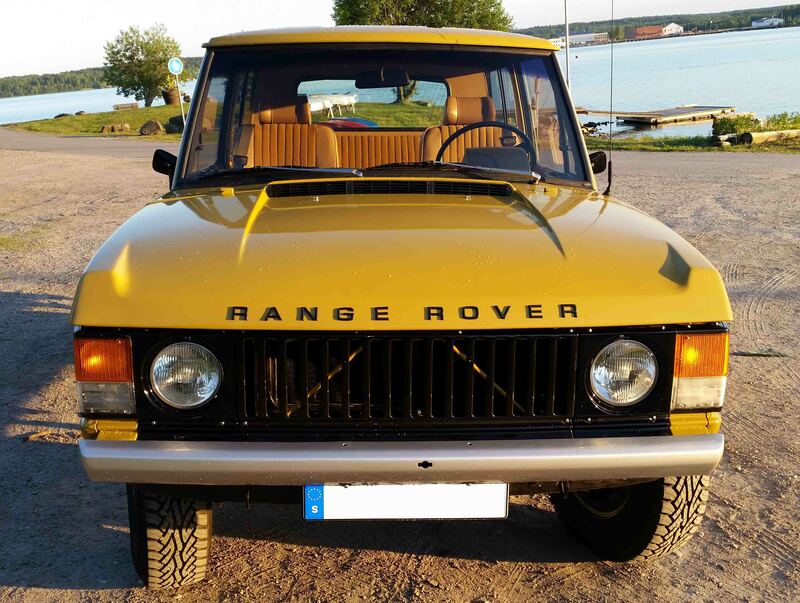 Before I could say anything else my son said “Do you want it?” in which my reply was “Yes it would be nice, but…” and before I could finish my sentence he duly told me “ Good, glad you like it as I have just bought it for you, we need to go collect it”! 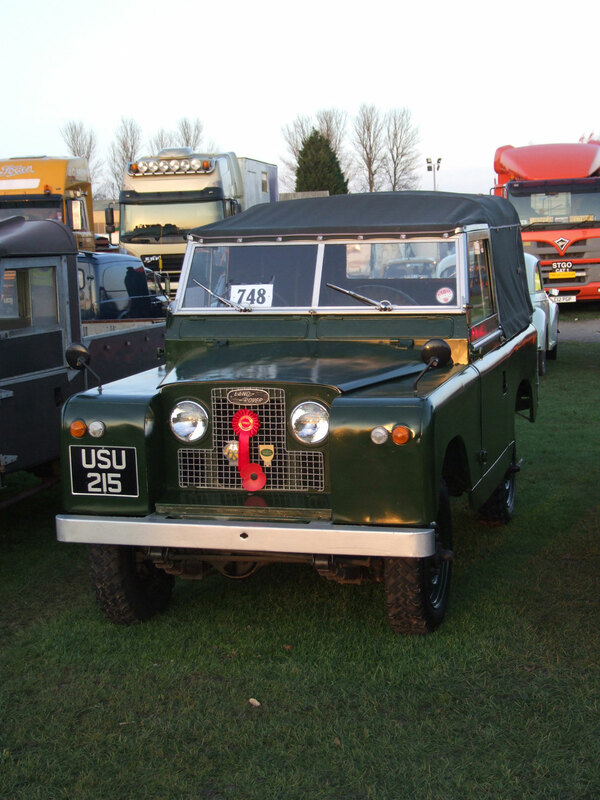 So there you have it, my first Land Rover was bought by my son as an early Mother’s Day Present. What I didn’t know was the fact that it was located on the west coast of Wales (and we live only few miles from Famous Four) and that it was a rolling shell and a large box of bits! 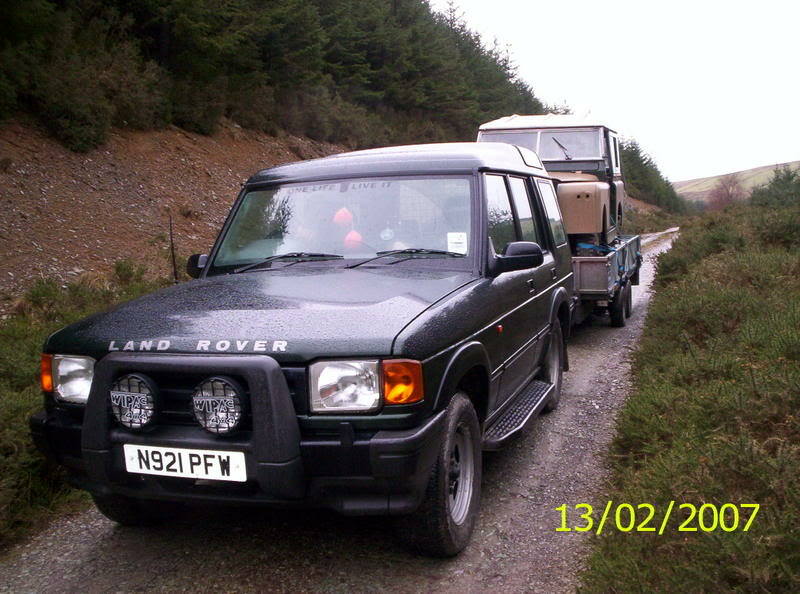 On a very VERY early morning in February we made the trip over to Wales, the Land Rover was located down a track in the middle of the Welsh hills on a small farmstead (This property had had no road access until about 2 years previous) and there stood my Land Rover. 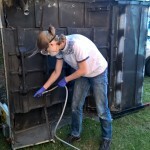 At first glimpse I wondered what my son had bought me, a rolling shell with lots of bits in cardboard boxes, but I was assured by my Husband and son that this was a great little project and was very original. 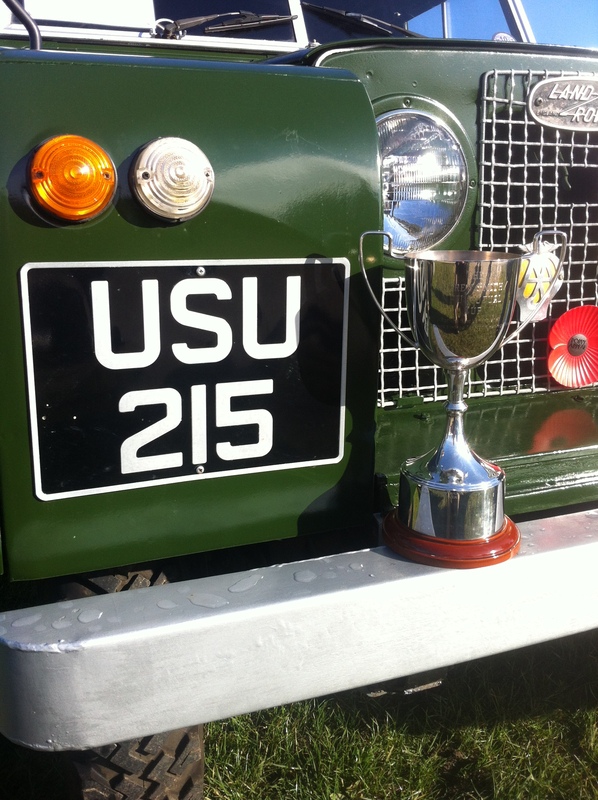 I spent some time looking around the Land Rover, and then noticed the number plate USU 215, and so there it was my Land Rover was named instantly as “SUZI”. A few hours later and the whole pile of “Suzi” and her associated parts was loaded onto our trailer and the 6 hour journey home was started, I couldn’t wait to get home and see what we had got! 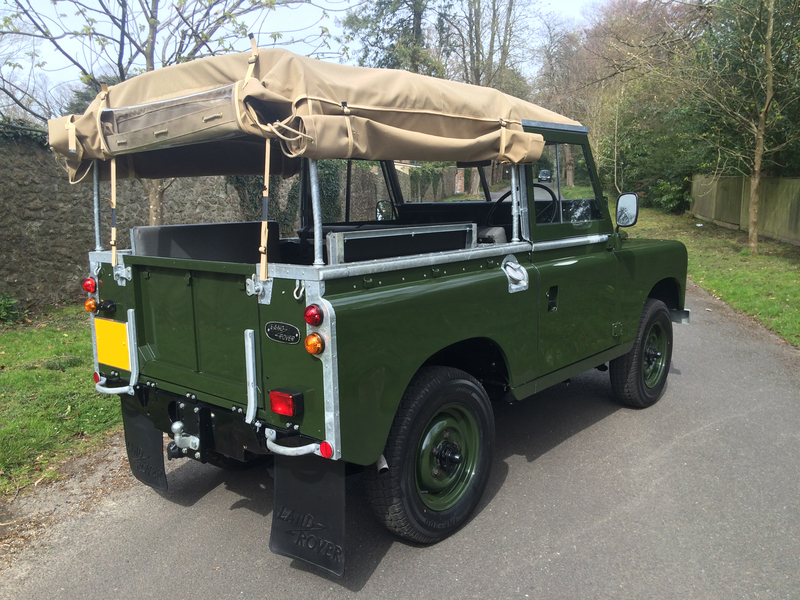 Over the following months my husband and son made great progress rebuilding her and was desperate to get her ready for the first show of the season, EASTER WEEKEND! 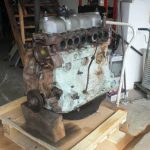 Many trips to Famous Four later and the basics were bought and she was up and running, a quick spray paint to get it through the first season was done, but a longer ongoing restoration was about to happen. 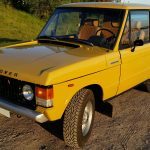 Many new parts was sourced by and bought from Famous Four over the next few years and gradually a build-up of correct and rare parts was collated. 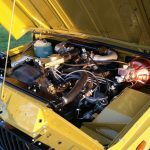 Many hours of time were spent researching and speaking to the historians and enthusiasts at Famous Four to make sure that “Suzi” was rebuilt to as near original as could be. 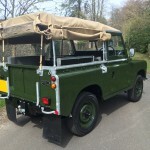 Many more new parts including all the service items, carb rebuild kits Canvass Hood, tyres, paint, cooling system to name but a few were purchased, once again, from Famous four and in 2013 went under another rebuild including a full strip and repaint with new correct series 2 door bottoms and tops. 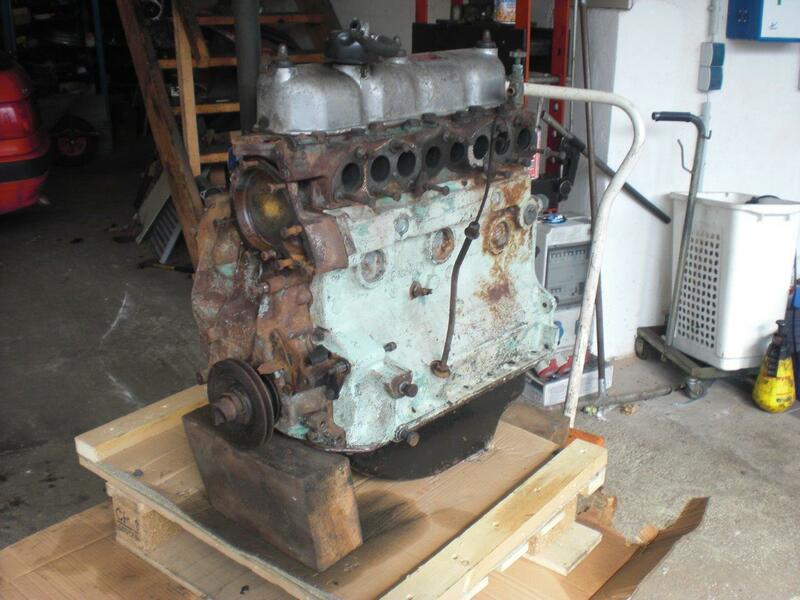 I hope the pictures do the rebuild and the car justice. 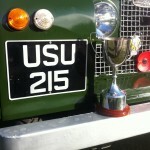 On a final note I would like to thank Famous Four for all their help with this rebuild and restoration project (It has been a long time and many hours, blood, sweat and tears to complete), with the final encore being in November 2012 and 2014 at the Newark Vintage Tractor and Heritage Show, “Suzi”, won best Land Rover in Show. 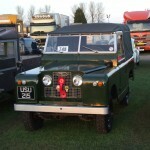 A true story of a Land Rover in a box to a prize winning show vehicle.